This is the first (hopefully) in a series of posts going Back to Basics, re-examining techniques and ideas introduced on teacher training courses. Many teachers are introduced to the idea of concept checking in their initial teacher training courses, try it out for a bit, and then forget about it. Sound familiar? finding out if a learner has understood a new item. With concrete items, this could be as simple as asking a learner to point to an object in the room. With more abstract ideas, this could be targeted questions to explore the parameters of meaning. Concept checking can help the teacher to see beyond doubt that the student has understood. 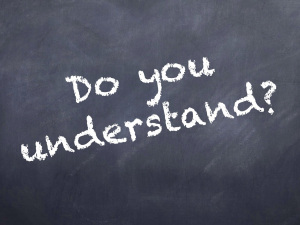 Asking the class ‘do you understand?’ is not so useful as it doesn’t demonstrate the learners’ understanding.